The following review was conducted in July 2017. The SIP-T58V is the newest high-end media phone from Yealink. The phone boasts the best video communication and screen we have yet seen for a desk phone. The T58V comes with a 7-inch 1024 x 600 touch screen and support for up to 16 VoIP accounts. The phone also has built-in Bluetooth 4.0+ for headsets and mobile devices. This device is ready, right out of the box, for serious business-grade voice and video calls. The following review was conducted in March 2017 and edited in February 2018 to remove mentions of Music on Hold incompatibility, as Yealink has since fixed this in a firmware update. The Yealink SIP-T19P E2 is a redesign of an earlier model, the Yealink SIP-T19P, which is on its way to being discontinued. The newer model preserves the popular features of the legacy phone, while expanding its capabilities and adding tweaks. The Yealink SIP-T19P E2 is an entry-level device with better functionality than other similar low cost options. The phone offers a single SIP line, with full call control functionality and HD codecs, making it ideal for low call volumes. This device would work well in a home office, a public waiting room, or any non-intensive calling environment. The following review was conducted in January 2017, and information on subsequent software updates and new version releases may not be reflected within. This review predates OnSIP’s desktop app, free to OnSIP users, so is not affected by bias. Counterpath's Bria for Mac is the macOS equivalent of the venerable softphone that's known to Android, iPhone, Linux, and other operating systems. 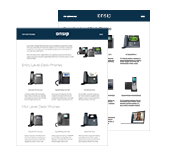 The current iteration for Mac supports HD voice and video calling, click to call, speakerphone, mute, transfer, 3-way calling, and up to 3,000 presence-based contacts. The following review was conducted in January 2017, and information on subsequent software updates and new version releases may not be reflected within. This review predates OnSIP’s mobile app for iOS and Android, free to OnSIP users, so is not affected by bias. Bria for iPad is a softphone developed with the power user in mind, marketing itself as a business productivity application. It offers several multitasking features that allow users to work on other iPad apps while maintaining voice and video communications. Bria for iPad targets the traveling business user and has some business class features, such as as automated call recording, presence, call forwarding, selective contact integration with Facebook and Google, and VPN support. The following review was conducted in August 2009. It has been about 8 months since we last reviewed iSIP. Back then, iSIP v2.2 had serious audio problems, few features to speak of, and didn’t work over 3G. A lot has changed in the past few months.